2.0 @ 30 degrees C. amb., 300:5 - 1.5 @ 30 degrees C. amb. 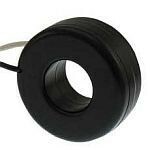 Flexible leads are UL 1015, 105 degrees C., CSA approved. #16 AWG, 24in long. Non-standard length to be specified. Terminals are brass studs No. 8-32 with one flat washer, lockwasher and regular nut. SHT and SFT case styles also available as SHL and SFL with leads. Mounting bracket kit 0221B00839 when required for Model 2SHT.